Santa arrived early this year and surprised me with the flu. 4 days prior to Christmas. Joy. What a lovely gift. Luckily, my doctor gave me a better gift and allowed me to do home IVs and skip the hospital, which was the best surprise of all. I hate the hospital, and having to go in during Christmas would have been horrible – a trip to hell for the holidays. That doesn’t mean there wasn’t plenty of pain and suffering to fill the holidays and my vacation. These virus-caused exacerbations shred me now. It’s getting harder to fight them as I get older and I’ve asked the CF team for pain management in the future, as my days of “manning up” to fight the discomfort are over. I miss the days of my youth when I fought viruses without hospitals and meds. Those years don’t seem real any more, but rather a past mirage I dream about. That was a different person, not me. So we moved our family Christmas a week to avoid me passing the plague to others, though my wife and daughter did get it, but not as bad as I did. It was more of a 3-day cold in my daughter and a mild cold in my wife. Meanwhile, I won three weeks of IVs. My inflammation shot from around 5 to the 100s and my O2 tanked. That seems to be the pattern now. While doing my treatments and opening presents with my daughter and wife on Christmas morning, I started coughing hard. I felt something snap or crack but couldn’t stop coughing before it broke more. A rib, probably. I was sitting in a chair I don’t normally sit in and the position must have put more pressure on my lower left side. Snap, crackle, pop. Luckily I had some expired Vicodin because the pain when I coughed or blew out was blinding. And I didn’t feel like going to the ER on Christmas. How fun that would of been. Today, three weeks later I end the IVs. Still not 100%, but feeling lucky to be alive after the beating I took. 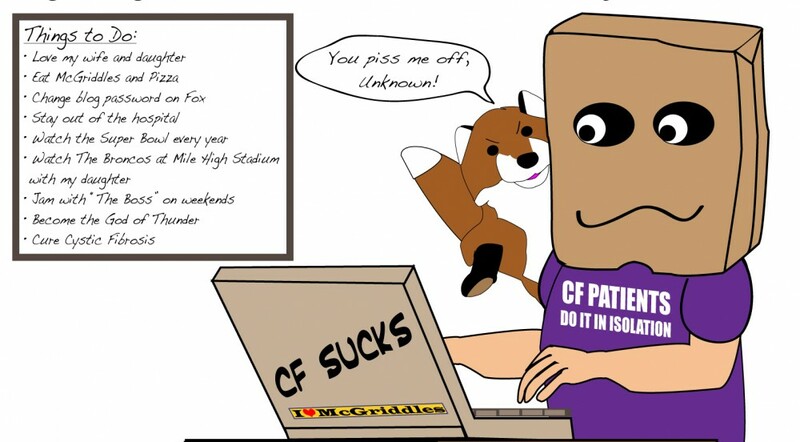 I know it can always be worse with CF and I should never complain. One day at a time filled with gratefulness is my plan moving forward.